*This post was created in partnership with Dove and Simply Stylist. All opinions are my own. Feeling fresh and carefree are two traits all women strive to be. Confidence is key, which is why I’m so excited to partner with Dove to share with you my favorite products for feeling my best. Whether it’s maintaining your frizzy hair in the humidity with your secret weapon hairspray, making your legs look smooth and shiny with your favorite lotion, or putting on your favorite long-lasting antiperspirant after a relaxing shower, all women have the basic essentials they can’t live without. 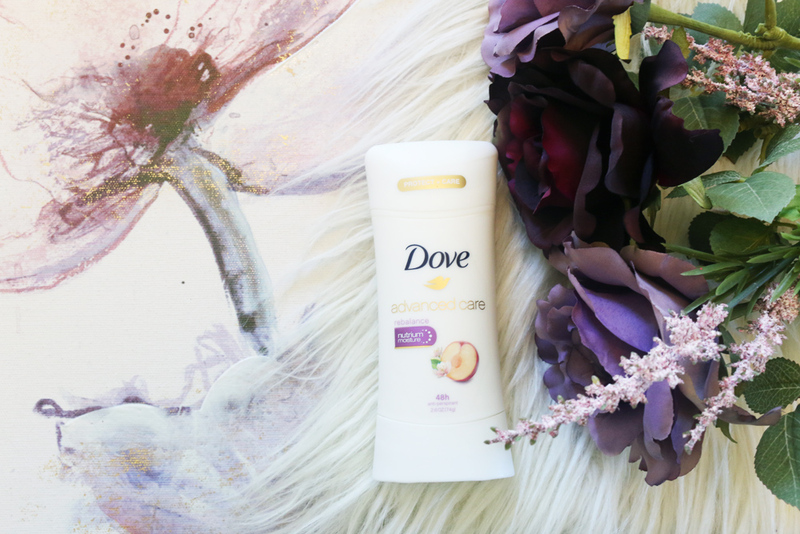 One of my favorite ways to feel fresh and confident is with my Dove Advanced Care Antiperspirant. It offers a full 48 hours of odor and wetness protection, plus its NutriumMoisture formula leaves your underarms feeling soft and smooth. Since I have very sensitive skin, one issue I have with my underarms is the dry skin and irritation after shaving. After a fresh shave, I layer on my Dove antiperspirant, which gives my underarms the softest touch. My favorite Dove Advanced Care scent is Cool Essentials (cucumber scented) because it gives such a clean scent. I have been using the Cool Essentials religiously for about 5 years now. You know it works like a charm when your fiancé asks what perfume you’re wearing but the only thing you have on is your Dove deodorant! I love Advanced Care products so much that I decided to try a different scent for this project, the Rebalance scent (plum scented). Maybe it’s time to switch up my routine after 5 years?! Maybe so, but I definitely won’t steer away from favorite beauty essential: Dove Advanced Care. 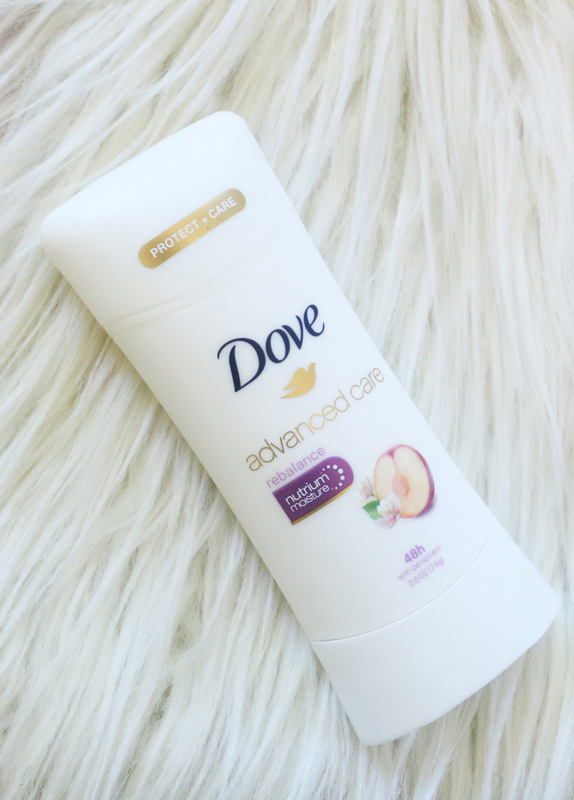 Dove Advanced Care Antiperspirant – You never know when you will need another layer throughout the day or even after work headed to an event or photo shoot! Hand Sanitizer – Working in healthcare has me crazy about hand sanitizer! It’s a great way to feel clean and refreshed, along with killing germs. Vaseline Lip Balm – I get cracked lips very easily so there’s nothing like some old fashioned vaseline to keep my lips feeling lush. Band-Aids – Because having a blisters and no access to band-aids is the worst feeling ever! Extra Hair Ties – Well maybe I lied, not having a hair tie when you desperately need one is the worst feeling ever! Tell me in the comments below: What is your favorite Dove product? That you Sarah, I completely agree! You never know what might come up after work or at lunch and you may need an extra layer. Great post. Want to try this product ASAP. I love Dove so much, I haven’t tried their deodorant yet though! Lindsey you definitely need to jump on the band wagon! Dove’s deodorants are the BEST! I always struggle to find the perfect deodorant, I’ll def have to try this! It’s been a beauty staple of mine for YEARS! I always struggle to find a scent I like so I will have to check this out! The scents are my favorite part! They are subtle and not overbearing at all. They make you feel so fresh and confident! I have been religiously using Dove spray deodorant for years now! My favorite scent is also the cucumber one! I also enjoy their hair spray which doesn’t smell like alcohol and their shampoo and conditioner for color-treated hair. I need to try the spray! I have heard such great things about it 🙂 I also use Dove’s hair products and I love how lush they make my hair feel! Dove is my favorite! I love the fresh smells and it always keeps me feeling clean! I am always looking for a new deodorant! I might have to try this out! 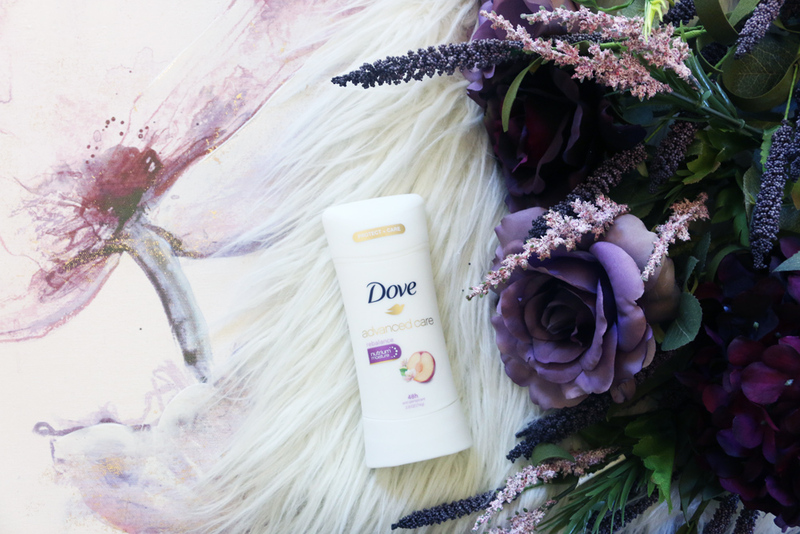 You will adore Dove’s deodorant! Such a great post! I love Dove’s deodorants. They’re light and have a great scent, plus still do the trick haha. Thanks for sharing girly! I am such a BIG FAN of the Dove brand and I love this post. Definitely going to check out all of these products and buying #1! It will change your life! Thanks so much Amanda! Dove is my favorite deodorant! I have been using it for years! Same here girl! That’s so awesome! Great post…really love all Dove products!! Loving your blog???????? Celi you are so sweet, thank you! Love Dove deodorant! They’re so soft and smell so good! Great post! i love dove, will have to check this out! I have never tried Dove deodorant, but now I totally am going to! Candice you need to jump on the bandwagon STAT! Right?! Especially as a trainer who is always working out a good deodorant is your secret weapon for sure! Oh no! I’ve never had that issue, hope you found something that works for you! Definitely an essential! I’ll have to try this one! dove is everything. i love their products! You’re a total Dove diva!! Loving this!!! I have to try it! Thanks for the recommendation. I have a min Dove in my workbag, and it’s definitely an essential when you have a packed day of client meetings! Great post! So true! You never know when you will need a fresh layer – it’s just like makeup! Isn’t it the best?! I love the new scent that I bought. Loved this post and very informative. Will have to try it! I have a similar bag of important necessities that’s in my car in case I need to freshen up after work and before I go somewhere else. I’ve seen the antiperspirant in target before, but never thought to buy. But it actually sounds like such a great addition to my bag, that I may need to grab some on the way home! !